AAV Transduction | Cell Biolabs, Inc. The process by which adeno-associated virus (AAV) infects host cells includes viral binding and entry, intracellular trafficking, nuclear transport, and viral second strand DNA synthesis. The second strand DNA synthesis has been shown to be the rate limiting step, which leads to inefficient transduction by AAV vectors. ViraDuctin™ AAV Transduction Kit is a proprietary, multi-reagent formulation designed to increase the efficiency of transduction by AAV vectors. Reagent preparation takes only 10 minutes prior to host cell infection. *Note: The number of transductions per vial is based on the use of 6-well plates or 35 mm culture dishes. However, the product may also be used with 96-well, 24-well or 12-well plates, as well as 60 mm or 100 mm dishes. See product manual for details. Figure 1: AAV-GFP Transduction Efficiency with ViraDuctin™ AAV Transduction Kit. HeLa cells were seeded at 50,000 cells/well in a 24-well plate overnight. 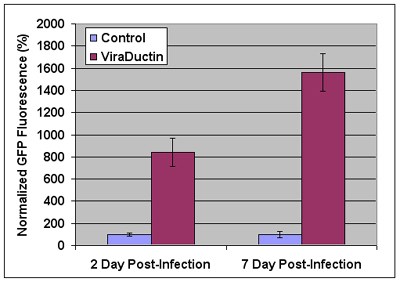 Cells were then treated with ViraDuctin™ reagents for 20 hours prior to infection with AAV-GFP. Figure 2: AAV-GFP Transduction Efficiency with ViraDuctin™ AAV Transduction Kit. HeLa cells were seeded at 50,000 cells/well in a 24-well plate overnight. 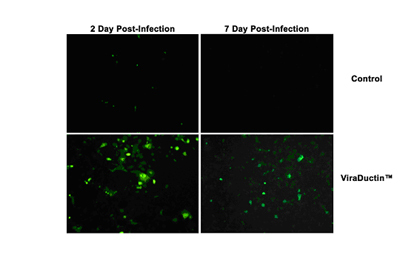 Cells were then treated with ViraDuctin™ reagents for 20 hours prior to infection with AAV-GFP. Nazari, M. et al. (2014). AAV2-mediated follistatin overexpression induces ovine primary myoblasts proliferation. BMC Biotechnol. 14:87.